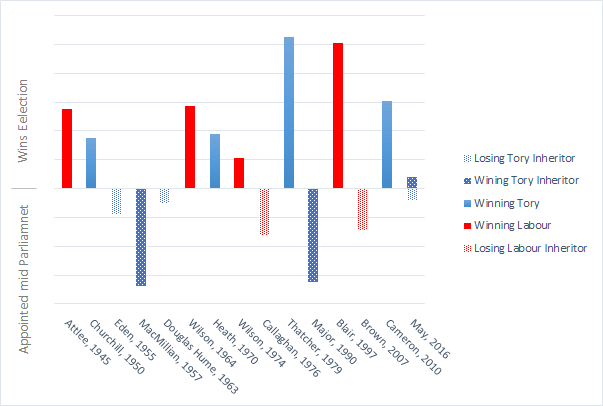 In this article at fullfact.org, the authors explore the success and otherwise of Prime Ministers that become so mid term, vs. those who become so by winning a general election. They do so over a 100 year period, including that between the wars where the long term decline of the Liberals as the voice of the working class, and the establishment of universal suffrage meant that long term changes in the politics of the UK were occurring, I examine the former here. I decided to examine the data from 1945, which “as any fule kno”, is when politics starts and history ends! I have developed the chart below, although I recommend looking at fullfact’s as they take a different visual approach. I define winners as those who became leader while in opposition and became Prime Minister as the result of a general election; their bars are above the line. Inheritors are those who become Leader while their Party is in Government and thus become Prime Minister; their bars are below the line. The length of the line shows how long they served. I use hatching to illustrate the success or failure of the inheritors. There are no successful Labour inheritors, the Tory successful inheritors have a dark hatching, and the inheritors that lost the next election have a light hatching. What can be learned? Not too much I think, the circumstances of each of the leaderships are so different. It interests me that both May & Brown were anointed without an internal competition, where as Major was elected in a competition against the best of his generation, or at last the best that was left after 10 years of Thatcherite purges, and we should remember that he resigned and forced a second leadership competition, although both of these were held under rules that only permitted MPs to vote. It’s possible that the evidence shows that primaries are important. None of this talks or considers the roles of those Leaders who never won an election, Gaitskill, Foot, Kinnock, Smith, Hague, Howard, & Duncan Smith, although the question is whether inherited incumbency is a poisoned chalice? Of the six inheritors, only two won their next election, but a lot of it is a long time ago. What do I do with this after the 2017 general election. There’s some justice of leaving it as it is, although technically Theresa May remained Prime Minister and the height/length of the bar should be changed. It’s certainly adds evidence that in the days of mass member parties acting as the selectorate, coronations are a bad thing.